Sometimes a debut album can become a smashing success that simply can’t be replicated. Selling in excess of 400,000 copies and winning the 1988 Australian Recording Industry Association (ARIA) Awards for best debut single (That's When I Think of You) and album, 1927 effectively became a household name in Australia overnight. While international success eluded them, that shouldn’t reflect on the wonderful musical experience that is ...ish. Ian McFarlane, in his opus The Encyclopedia Of Australian Rock And Pop, put it perfectly when he wrote ...ish is brimful of stirring, stately pop rock anthems. Yes, dear reader, it is that good! To Love Me is a great opener that is truly representative of the Australian music scene during the 80s. It is recorded, mixed, and mastered beautifully, as is the entire album. That’s When I Think Of You has a beat, vocal presentation, and guitar solo that are off the charts. There is no pretentious playing here, it is simply beautiful! This is what good music sounds like, you literally won't be able to stop your body moving to the rhythm. So good! If I Could is rock ballad heaven. Listen to the song once and you’ll be singing it for the rest of the day. If I Could is simply stunning! You'll Never Know picks up the tempo, but doesn't feel out of place in the tracking of the album. By this stage, if you haven't already turned the volume up, I suggest you do so. Get that air guitar out and warm up those vocal cords, you're going to need them. Compulsory Hero is one of the greatest songs ever recorded, by anyone, anywhere in the world. It is an unofficial Australian anthem and not only does it bring me to tears, but it makes me proud to be an Australian. It’s a sonic masterpiece! All The People is a great pop/rock tune, but it was always going to be difficult for any song to follow Compulsory Hero. Thankfully, in the minute or so it takes to flip the record, the senses have a chance to reset. Regardless, All The People is a worthy addition to the album. Nothing In The Universe is a lovely song. While not on par with some of the earlier songs, it is certainly no B-side. Propaganda Machine has an interesting punk/pop feel to it. I love it! Give The Kid A Break has a sensational beat and series of guitar riffs. I hope you didn't turn that volume knob down as this song deserves to be heard at ear bleeding levels. While a B-side, no one ever said a B-side couldn't be thoroughly enjoyable. The Mess, unfortunately, doesn't follow the quality B-side that is Give The Kid A Break. The mess is, for lack of a better term, a mess and sounds like pure filler. That, however, doesn’t deter me from flipping back to Side A and enjoying this sensational album once more. 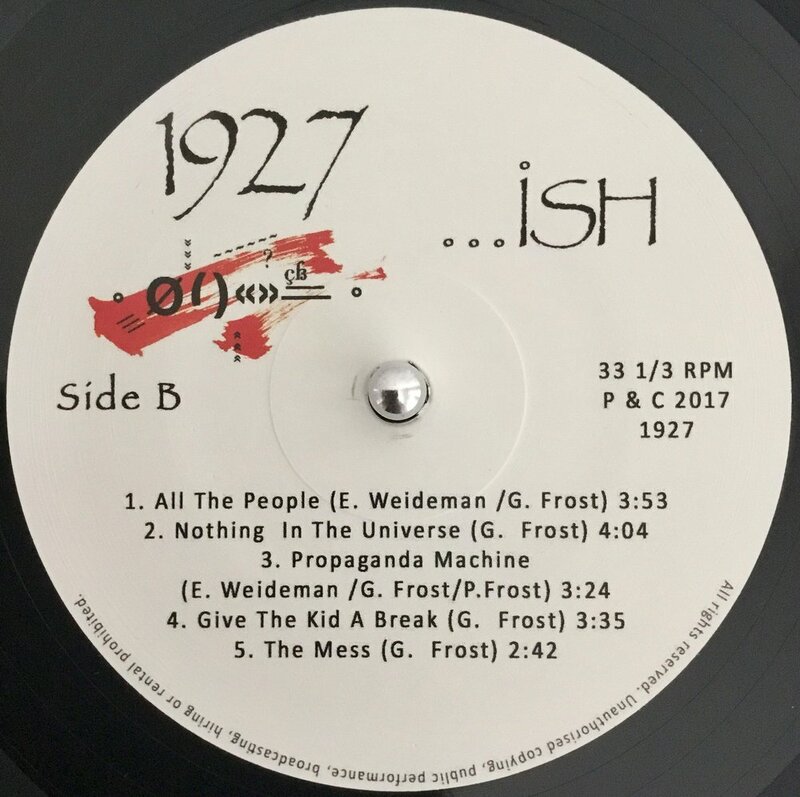 ...ish is not only one of the greatest albums ever recorded by an Australian band, it is sonically and musically on par with all the greatest bands of the era. In fact, the production quality here is world-class and it truly shows on the 2018 vinyl re-issue. Pressed at the world-renowned Pallas plant in Germany, I’ve never heard this album sound so good…ever! The record is pressed on audiophile quality eco-grade vinyl and is so silent you’ll hear the blood rushing through your veins before you hear any unwanted surface noise. The soundstage is immersive, with incredible depth that proves just how good vinyl can sound if diligence is taken in the mastering and pressing process. Yes, the remastered edition on TIDAL Hi-Fi is excellent, but it pales in comparison to the vinyl release. I could honestly keep talking about how exceptional this album is, but I suggest you just order a copy and experience it for yourself. ...ish is available on Vinyl, CD, the TIDAL Store (16/44.1kHz FLAC), and iTunes. If you prefer streaming, ...ish is also available on TIDAL Hi-Fi, Spotify, and Apple Music.